Access to the application is restricted to authorized users (see Access authorizations in CCManager). 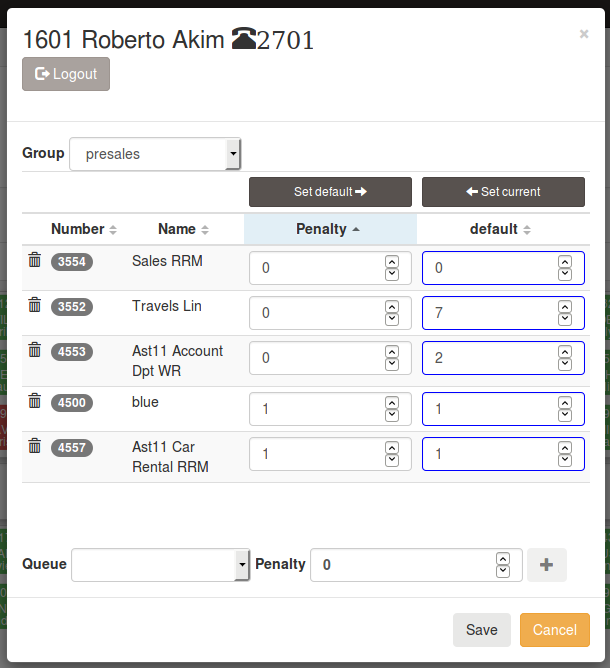 The queue/active penalty couples can be saved as default configuration by clicking the “Set default” button, then “Save”. The queue/default penalty couples can be saved as active configuration by clicking the “Set current” button, then “Save”. 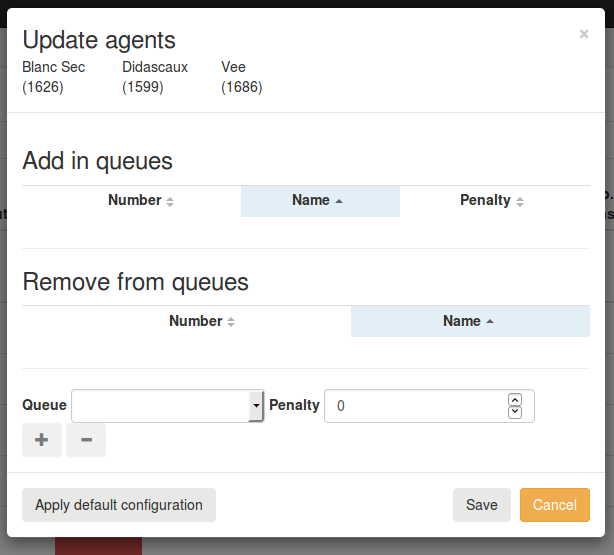 Emptying the penalty textbox and saving will remove the queue from the active configuration for the agent. Emptying the default textbox and saving will remove the queue from the default configuration for the agent. 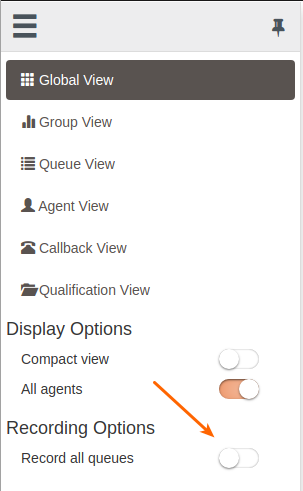 From agent view you are able to add or remove more than one agent at the same time. 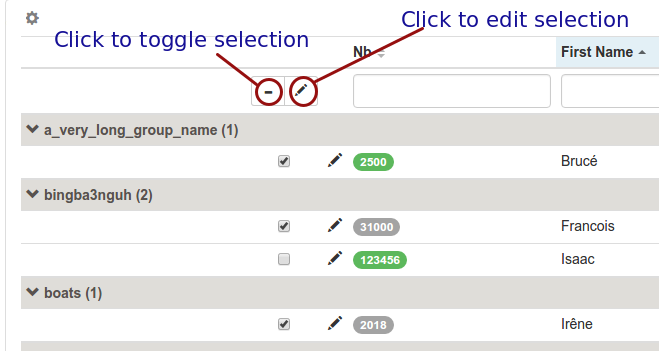 Click on the plus button to add a queue for selection, click on the minus button to remove a queue to the selection. Once queue to add or removed are choosen, click on save button to apply your configuration change. Click on “Apply default configuration” to apply existing default configuration to all selected users and make it the active configuration. This action only affects users with an existing default configuration, agents whithout default configuration remain unchanged. 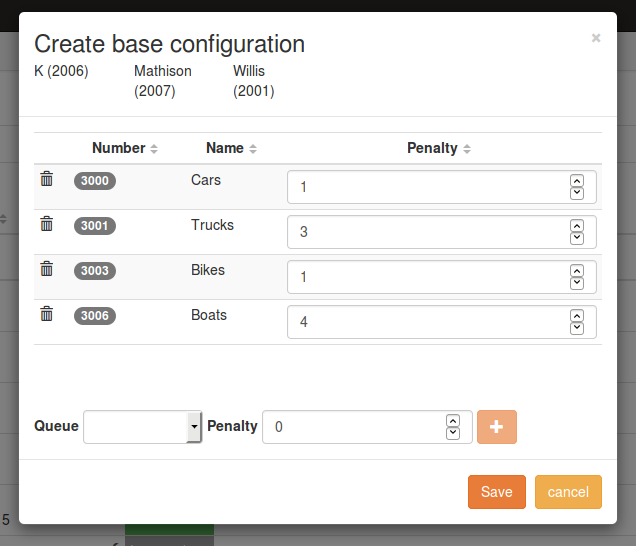 ‘Create base configuration’ will allow you to create a base configuration from scratch for all the selected agents. 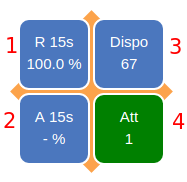 ‘Create base configuration from active configuration’ will allow you to create a base configuration using the selected agents active configuration. The queue membership and penalty populated will be built based on the merged membership of all the selected agents. In case of conflict, the lowest penalty will be used. Click on the plus button to add a queue for selection. Once your configuration is complete, click on save button to apply your configuration change. In order to re-apply or apply a default configuration, you may select agent whose base configuration is different from active configuration. You can use this column to filter agent whose base configuration is different from the active one and then apply the default configuration by using the “Edit agent” option. Once you setup queue recording in XiVO (see Enable recording in the Queue configuration), visual indicators are displayed next to queue name in Global view. Respectively following icons represents recording mode set on the queue. Furthermore shortcut action is displayed in the left menu to control the activation / deactivation of all recorded queues. The switch will change its position in case the queue’s recording status is activated / deactivated through XiVO Web Interface accordingly. The switch button will either activate all queues configured with recording mode set (Recorded or Recorded on demand), or stop the recording feature for all queues. Action is applied only for next calls. Ongoing call recording is not started nor stopped when switch is triggered. 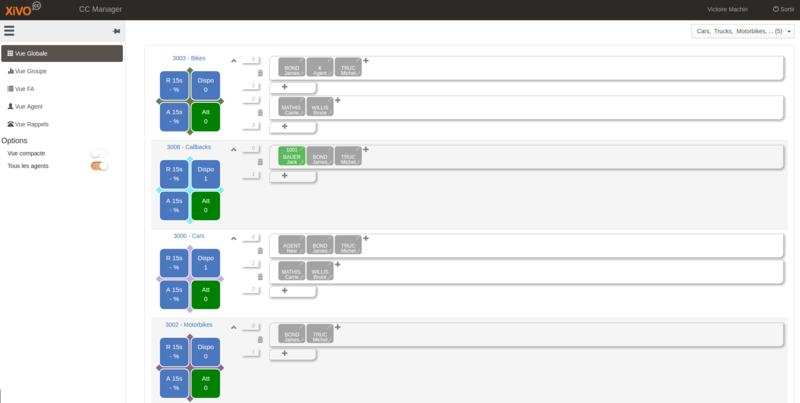 This view allows to manage callback request see Managing Callbacks Using CCManager for details. This view allows to export calls qualification see Call Qualifications. To export the qualification answers, open Qualifification View page. Select the date from, date to and queue. Then click to Download button. This will open new page with CSV file to download. When exporting data from the same day, select date to to be +1 day of date from.